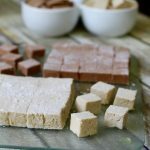 If you are looking to WOW your guests with a unique dessert you must try this EASY TO MAKE marshmallow recipe. 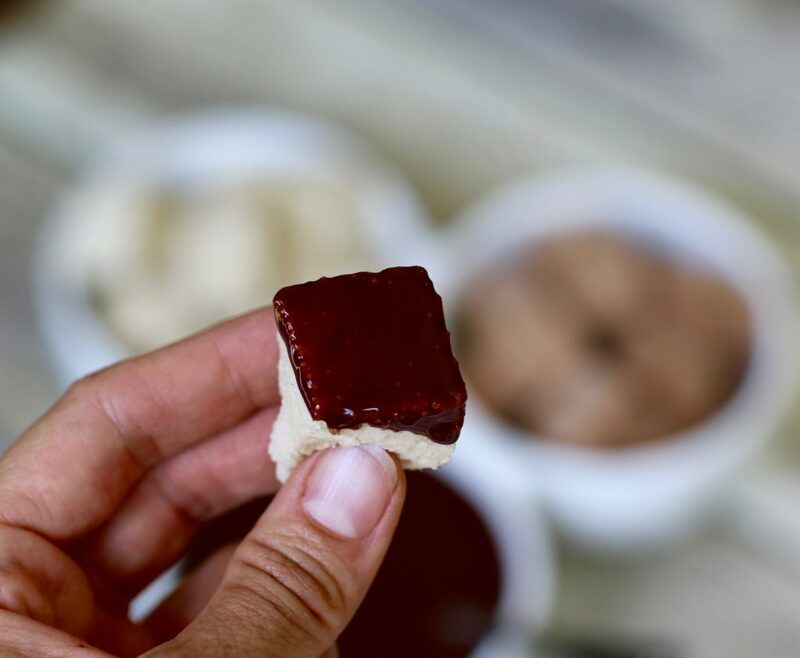 The soft texture and sweet vanilla and chocolate taste of this wonderful bit-sized delight is sure to have you and your guests wanting more. 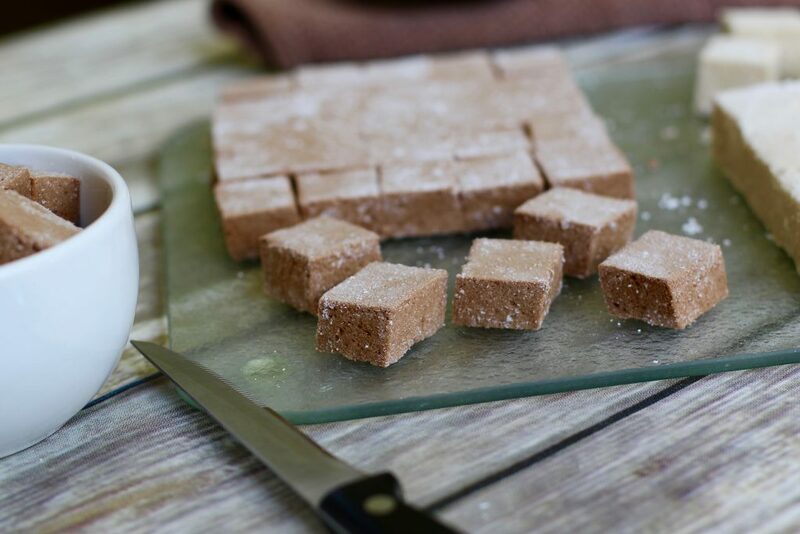 NO CORN SYRUP or REFINED SUGARS makes this recipe a much healthier choice. My husband is in a push-up challenge and he is doing 22 push-up for 22 days to raise awareness for combat veterans that commit suicide… so sad. I thought this would be a cute video to share with you. There is not much else going on this week, just wedding planning, marathon training and 4 children to manage. I started my uber shift again since the kids are doing local camps now and I am driving them everywhere. For the past 4 weeks a bus drove 3 of my boys to camp and back and I only had 1 child to tend to at home for most of the day. I guess my 1 month vacation is over. Now I am planning a few fun excursions for the next few weeks so I will have something interesting to write about! Since I am on a dessert kick at the moment, what better way to satisfy some sweet cravings than a soft, gooey, bite-sized piece of heaven. 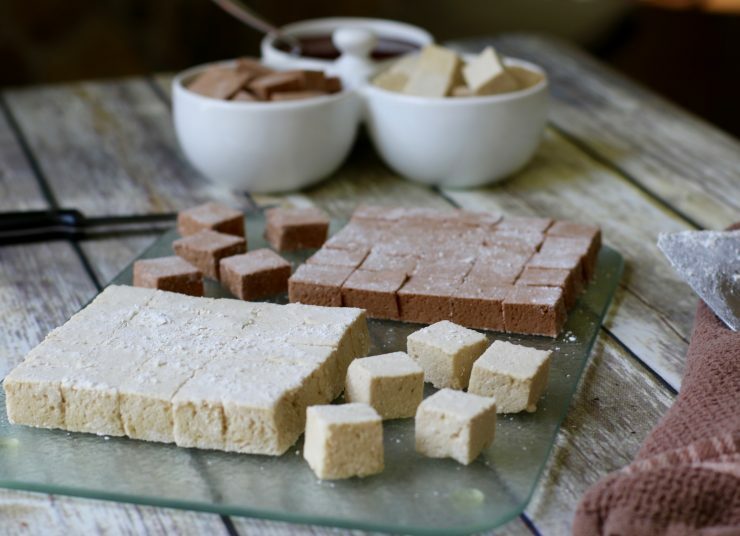 These marshmallows certainly do the trick and they are so hard to resist you will be coming back for more. It is interesting how I stumbled upon creating this recipe. You don’t just wake up and say, “Hey, I want to make marshmallows today”. It is one of those ingredients you would buy and add to a recipe, right? You would not think of making them yourself. Years ago, when I became more health conscious, reading every ingredient was all I did and still do before buying something packaged. I discovered that marshmallows contain dyes. Yes!!! Those white little spongy treats contain BLUE DYE to give them a brighter color! 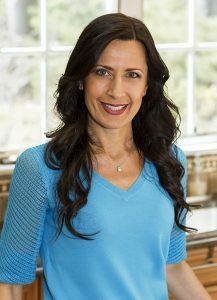 I avoid feeding my children anything with food coloring because of the adverse side effects it has on their mood and behavior. So the Mad Scientist was at it again transforming an unhealthy treat into something my boys would enjoy and I won’t cringe when they eat it. It worked! Now I have something fun to make for them especially when they are behaving. I definitely try to limit the amount of sugar they consume but it is nice to see a big smile on their faces when they take a bite of this sweat treat. Everything in moderation, right? 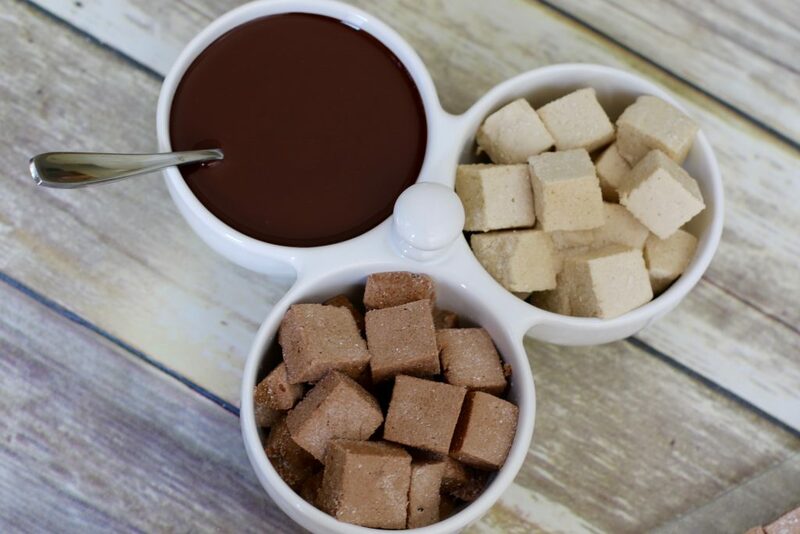 I decided to use my Homemade Vegan Chocolate Syrup I recently posted as a dip to give the marshmallows an added touch of rich chocolate flavour. Boy did that go over well with my little guys! These decadent, bite-sized morsels will definitely be a crowd pleaser at any gathering. Unique, soft and tasty this recipe is sure to satisfy your sweet tooth craving. In a 8x8 square pyrex add the arrow root (but not all of it) along the bottom and sides. This prevents it from sticking when pouring in the mixture. Set aside. Add water, vanilla and salt to a deep mixing bowl and combine. Slowly sprinkle the gelatin over the surface but do not mix it. Set aside. In a sauce pan, slowly bring maple syrup and cream of tartar to a boil over medium heat. Place a candy thermometer into the mixture and allow it to continue to boil until it reaches 240 degrees. This should take about 7 - 9 minutes. Remove from heat and slowly beat the hot syrup into the gelatin using a handheld or standing mixer. Beat until the mixture thickens to a creamy consistency for about 10 - 15 minutes. Pour the mixture into the pyrex, scooping it out with a spatula. Dust some more arrow root on top of the mixture and let stand for about 2 hours at room temperature until firm to the touch. 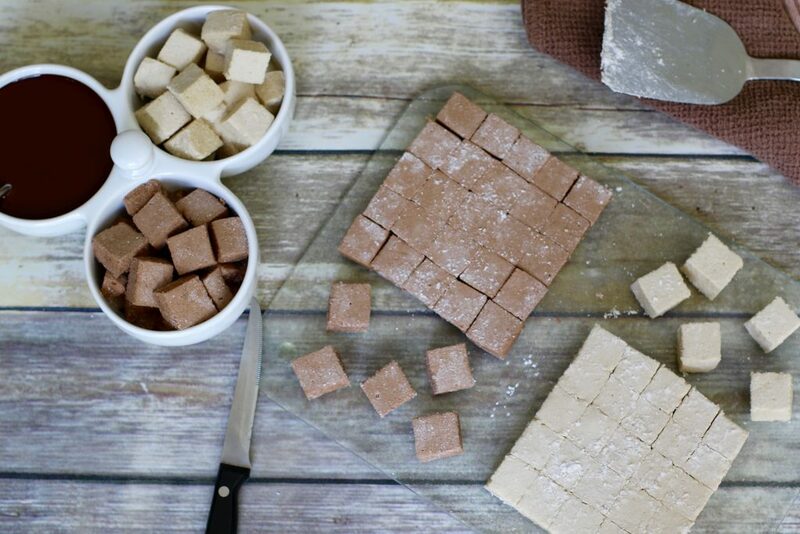 Slice the mixture into small cubes using the starch to prevent it from sticking. Store in an airtight container at room temperature for about a week or freeze. 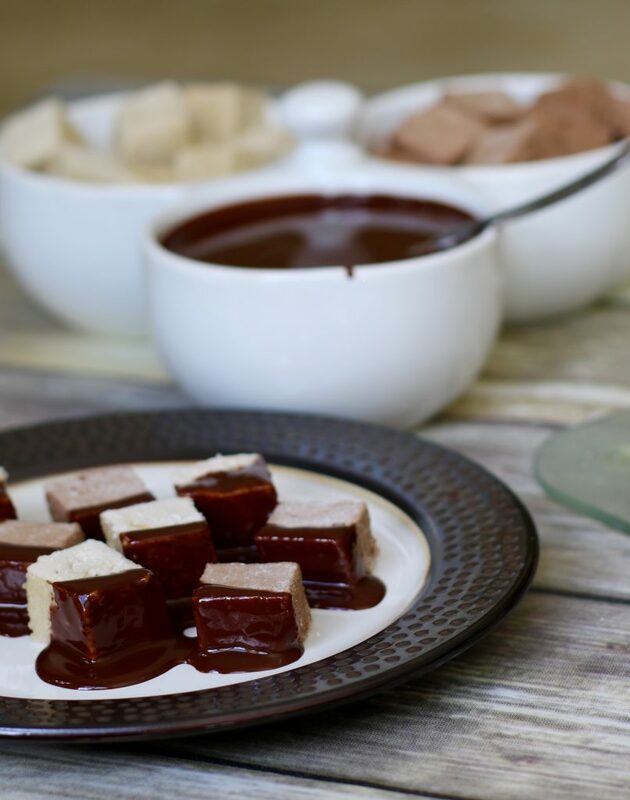 For chocolate marshmallows add 2 tbsp. raw cacao powered in the last few minutes of beating. Did you know marshmallows have dyes in them? Do you have an interesting dessert to share? I love the video of your husband and the kids doing push-ups. You have instilled a healthy life style in your home. Congratulations!! It’s not easy, but you continue to explore for options in a home where you have allergies, etc…not every parent would do that. These marshmallows look great!! I will be sure to try the recipe!! Thanks so much! I try my best to make sure my children do not feel left out because of the food they cannot eat. Do you know if you can toast these over a campfire with the kiddos? I have actually never tried toasting them… sorry!